The people who live in towns and cities along the Mississippi River in the southern United States are a special breed, steeped in 500 years of history as rich as the coffee they drink, or the soil where once the river ran. 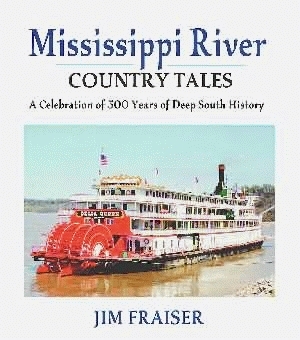 Mississippi River Country Tales is a fast-paced, easy to read history that covers everything from the early conquistadors and the first Mardi Gras to Fannie Lou Hamer and Archie Manning, and covers the geographic region from Mississippi, Tennessee, Alabama, and Louisiana. Jim Fraiser is a practicing attorney, and has appeared in a number of plays and films. He is a contributing editor and columnist for the Metro Business Review, and is a contributing writer, columnist, and reviewer for the Northside Sun. He is also the author of Shadow Seed, published by Black Belt Press in 1997, and M is for Mississippi: An Irreverent Guide to the Magnolia State, published by Persimmon Press in 1991. Mr. Fraiser lives in Jackson, Mississippi, with his wife and two daughters.